Hi. My name is Jessica, and I’m an Instagram addict. It all began in 2011 because of Instagram’s ease of use and lack of ads. The clean interface coupled with its playful filters made me an obsessed follower. Oh, and above everything, I loved the inherent lack of sales. In the obnoxious online world that screams in our faces every day, Instagram was the rare medium where I sought solace. Artists and creatives could tell their story in a quiet, simple oasis. But when Facebook bought Instagram in April of 2012, things started to get scary. If you throw your products at me, I will roll my eyes, and unfollow you forever. Here’s the thing: I’m not on Instagram to follow brands or to buy things. But if you enter my feed with style and grace, I will listen. I will follow. And I may (eventually) purchase your product. Here’s how you can get me interested: Tell a story that’s personal yet universal. This approach allows your brand to speak softly yet make a big impression. Instagram is a post-verbal platform. If you’re screaming to your potential customers without a story or nuance behind what you do, you’ll lose trust and credibility. But if you share a pretty photo with an interesting caption, you’ll win my attention. Check out jewelry company James Michelle , a brand whose posts I look forward to seeing. The brand curates beautiful, fun images that speak to me as a human being and not as a customer. While it’s a jewelry brand, the images go beyond simply “selling jewelry.” They sell the journey, and I want to be on board. Cute dog pics? Check. Inspiring quotes? Check. Imagery of the sea? Yes, please. The simplicity in their strategy allows me to regard their brand as more of a collaborator than a store. I get inspired, and yes, I sometimes even smirk when scrolling past their images. Here’s a photo of a turtle. Will I purchase a piece of jewelry based on…a turtle? Maybe not right when I see it. But it will remind me that I still want to buy one of their necklaces. 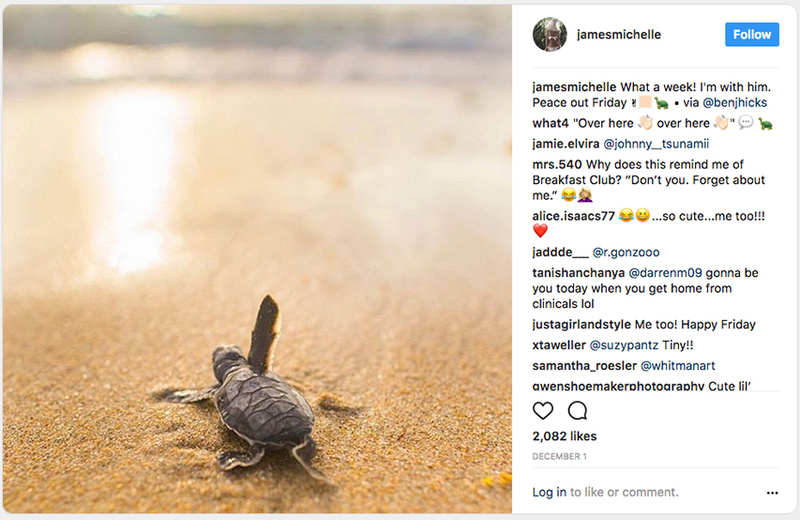 Just like a turtle, Instagram marketing is best with a slow, steady pace to your sales cycle. Sharing images on Instagram is not just about a product. It’s about who you are – and how your business can benefit your customers. And with this comes the need for more meaningful storytelling on Instagram. But let’s take a step back to just a few years ago, to see how far we’ve come. A solid review of your products used to be enough to get marketing traction. But today, a solid review only tells a small story to an even smaller audience. To gain momentum, you’ll need to get customers to generate content for you. In the marketing world, this concept is known as “User-Generated Content, but I think of it as Undeniable Glorious Connections. And that’s exactly what UGC is about: creating an Undeniably Glorious Connection between your brand and your customers. The digital revolution has amplified and accelerated its (word of mouth) reach to the point where word of mouth is no longer an act of intimate, one-on-one communication. Today, it also operates on a one-to-many basis: product reviews are posted online and opinions disseminated through social networks. According to McKinsey, word of mouth is the primary factor behind 20 to 50 percent of all purchasing decisions. One way to disseminate opinions is through visual imagery. Millennials love pictures, and the bigger picture reveals itself when you determine how your brand fits into it. For example, when I saw that a brand called the Dharma Yoga Wheel was actively stocking their Instagram feed with images of customers using their product, I wanted to participate. I shared a post of myself in a yoga pose and tagged them in the photo. They then reposted my image to share with their audience. My image became more than a mere image. It became a way to connect with the lives of other humans who also enjoy the Dharma Yoga Wheel product. By sharing my photo, I posted my story to show off my yoga skills and to share what I’m about. I love yoga, and I get excited when I can show brands that I love their product. Bonus that the brand can use it in their marketing because people will trust what I say more than the brand itself. The good news is that getting the rights to UGC is easier than ever. When you see content from Instagram and Twitter you’d like permission to use, ShortStack leaves the poster a comment asking for their consent. When they reply “yes,” ShortStack detects the reply and notifies you that you’re free to use the content. The Dharma Yoga Wheel uses effective user-generated content to connect with their customers in a real, relatable way. When marketing on Instagram, you’re away from the “breaking news” energy of the other platforms, so you have the bandwidth to be more brilliant and to share more breathtaking imagery. Going full-bore with marketing or paid advertising on Instagram will get you nowhere if you don’t show personality. Here’s why: Instagram is not an ad platform. Let me repeat that: Instagram is not an ad platform. If you’re using ads on Instagram, the effort will only work if you use it in tandem with content marketing that injects your personality. Even though a lot has changed since Facebook bought Instagram years ago, it remains a haven from untargeted ads, and it has (for the most part) protected its users from the bastardization of social media. Content marketing shows people what you’re about, which, when done right, allows people to pay you for your personality. According to studies made at the Carnegie Institute of Technology, 85 percent of a person’s financial success is due to skill in human engineering – to personality and the ability to lead people. Ads pay for people to like you whereas content marketing shows people what you’re about, which, when done right, allows people to pay you for your personality. The untargeted ads of the past through traditional media (billboards and newspaper ads) are often a waste of money, because of the “spray and pray” approach. When you pay for an ad that doesn’t inject personality, you’re paying for mere attention (aka brand awareness). But when you use a targeted ad alongside a strong brand voice, you hone in on the niche of who you’re trying to reach. Said another way, you rhyme to bring in the dime(s). When you show personality on Instagram, you inject your signature “wink” into your brand voice – which catches your customer’s attention and keeps them coming back for more. Raise your hand if you love individuality. Now, raise your hand if you didn’t raise your hand because you’re an individual who doesn’t do what the commoners do. Whether you raised your hand or your eyebrows, a Millennial nearby is judging you. Above everything, Millennials love that little something called “individuality.” The irony about individuality is that it’s nuanced. When you speak to our values and lifestyle, you can speak to who we are as human beings – and who we want to become. Here’s an example: A Cognac producer struggled with content creation on Instagram. They needed fun photos (that weren’t stock images) that spoke to their African American Millennial audience. Instead of creating the images themselves (which, let’s be honest, probably would have bombed), they surrendered the content creation process directly to their target audience. 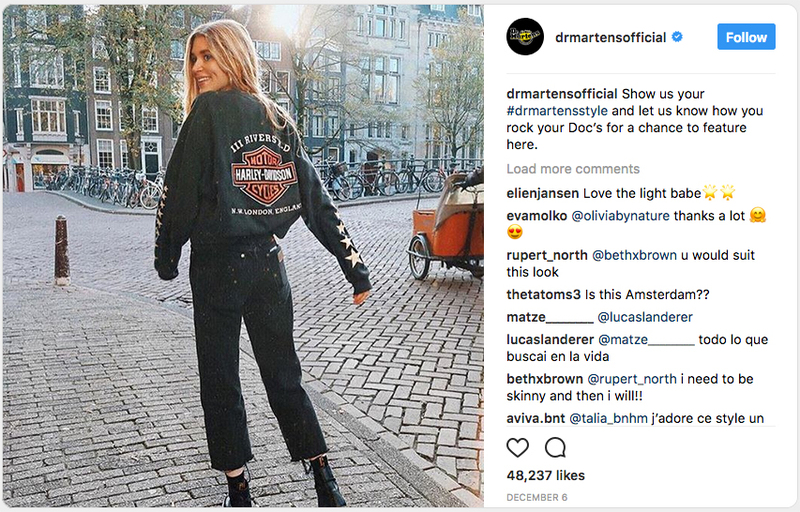 The agency running the campaign created a #customhashtag and instructed their audience to use said #customhashtag when posting images to Instagram. Voila! Images with cocktails and people having fun (with the Cognac brand in the photos) were magically created. The Cognac product became part of the conversation, not because the Millennials were forced – but because they were having fun! And here’s where the contests come into play: The image with the most likes received an all expense paid trip to their vineyard in Cognac, France. The contest shows that Cognac isn’t just a mere product. The brand elevates itself to become a place, a haven, for their customers to enjoy life. Both the agency and the Cognac brand were mostly “hands-off” as the heart buttons lit up to drive engagement. Soon the Cognac brand had an organic call-to-action for the contest. The client grew by 10,000+ targeted followers and they did not have to create one piece of content in the entire time frame of three months! Creating a campaign like the Cognac brand will make you the opposite of a cog in the wheel. Not news to you. 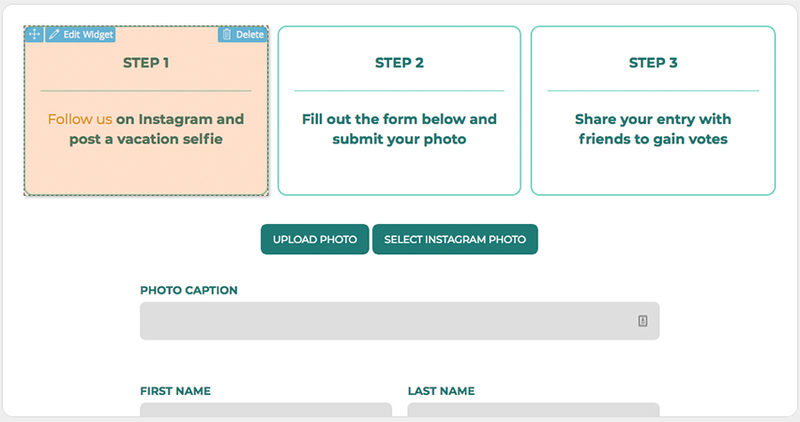 You’re hip, fun, and creative and you’re looking for an Instagram platform that stays on your level. If you’re looking to increase your data collection and entries, and encourage shares, you hit the campaign jackpot just by reading this far in the article. Campaigns are not hard to set up. Just look at the screenshot with the three steps below. Captions communicate your values and they often allow your audience to fall in love with you for your lifestyle – not your products or services. Here’s a fun story (stay with me here): one of the first brands I fell in love with was Dr. Martens in the 90s. This brand sells boots “worn by rebels and non-conformists of all stripes.” I’m rolling my eyes because I was wearing my Dad’s jeans and listening to Kurt Cobain (along with everyone else in my class). Clearly I was a rebel who needed the right shoes to complete my look! But I had a problem: Dr. Martens in my size (6) were rarely available in the U.S. because they were the sample shoe size – and sadly, the first to sell out of stores. Captions communicate your values and they often allow your audience to fall in love with you for your lifestyle – not your products or services. When you appeal to millennial minds through a good story that has a strong caption, you sell speak to us based on who we are as humans. We’re not dollar signs. We simply want to feel good about promoting your brand. When you do a good deed (like a Doc Martens giveaway! ), you’ll defy our expectations and stand out.